One of the most healing fruits on Earth. Yes it is a fruit. Really good for flushing kidneys, detoxifying the system, cleansing the bowels, digestive health, contains an enzyme that dissolves tapeworms, and has lots of calcium, magnesium, sulfur (beauty mineral) along with Vitamin E and C. Cucumber juice does wonders for complexion. Buy or grow organic and eat the SKINS TOO, which are very high in silica, minerals and enzymes. (Cucumis sativus), an annual herbaceous vegetable crop of the family Cucurbitaceae. The root system consists of a taproot, measuring up to 1 m in length, and lateral roots, which are usually in the upper soil layer at depths of 10 to 30 cm. The stem, which is a climbing or trailing vine, is up to 1.5–2 m long. There are also subshrub forms. The leaves are alternate, slightly lobed, and five-angled; they have crenate edges. As a rule, the plants are monoecious and diclinous; some forms are partially dioecious, having predominantly female or male flowers. The fruit, which is known as a cucumber, varies in form and size; it can be anywhere from 5 to 100 cm in length. There are seedless varieties. 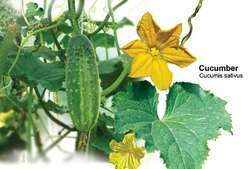 The cucumber plant requires light, moisture, warmth, and fertile soil. The optimum temperature for growth and development is between 25° and 27° C; the humidity should be between 70 and 80 percent, and the soils should have 60 to 80 percent moisture retention. Cucumbers are found throughout the world and are cultivated in almost all countries. They are particularly important crops in the USSR, the United States, China, Japan, and India. The species is thought to be native to India, where it was widespread 3,000 years before the Common Era. About 50 percent of the world’s plantings of cucumbers (158,900 hectares [ha] in 1973) are in the USSR. Cucumbers are raised as field crops and by forcing. The yield from plants under field cultivation is 300–400 quintals per ha and greater. Greenhouses yield 20–35 kg of cucumbers per sq m, while hotbeds produce 15–18 kg per frame. The immature fruits are eaten in fresh, brined, and pickled forms (gherkins and pickles). The fruit’s chemical composition at maturity is 95–96 percent water and 4–5 percent solids, which include 2–2.5 percent sugars, about 1 percent protein, 0.1 percent fat, 0.7 percent cellulose, and 0.4 percent potash. The cucumber contains vitamins C, B1, and B2; provitamin A; organic acids; and essential oils. As of 1974, 61 varieties of cucumbers had been developed for regional field cultivation and 40 varieties for forcing in the USSR. The most common field varieties are Altaiskii ranii 166, Nerosimyi 40, Viaznikovskii 37, Dolzhik, Tashkentskii 86, Riabchik 357/4, Uspekh 221, Nezhinskii mestnyi, Nezhinskii 12, and Donskoi 175. The most common varieties for cultivation by forcing are Klinskii mestnyi, Mnogoplodnyi VSKhV, Gibrid Teplichnii 40, Gibrid Alma-Atinskii 1, and Gibrid TSKhA. In open ground, cucumbers grow best in fertile, sandy soils in south-oriented plots protected from cold winds. Soil preparation includes fall plowing to a depth of 25–27 cm, spring cultivation to a depth of 10–15 cm, and presowing cultivation with harrowing to the planting depth of 4—5 cm. The seed may be sown directly in the field, or seedlings raised in special soil in boxes may be planted. Earlier harvests of higher yield can be obtained by placing temporary polyethylene covers over the plants. Sowing or transplanting may be done in rows or hills. The rows should be 70 to 90 cm apart, and the plants should be spaced 6 to 30 cm apart. The space between hills should be 70 cm. The plants should be thinned twice. Tilling between rows should be done three or four times. Light tilling of the hills and rows four or five times is also advisable. Organic fertilizers (60–100 tons per ha) and mineral fertilizers (nitrogen, phosphorus, and calcium—up to 10–12 quintals per ha) should be applied. The plantings should be irrigated at a rate of 150–500 cu m of water per ha; the watering rate is determined by growing conditions. Measures should be taken against plant disease and pests. Cucumbers are the principal vegetable crop cultivated by forcing and are raised in various types of growing facilities. The most serious pests of cucumbers are spider mites and aphids; the principal diseases are bacteriosis, downy mildew, white rot, and anthracnose. Spravochnik po ovoshchevodstvu. Edited by V. A. Bryzgalov. Leningrad, 1971. Cucumis sativus. An annual cucurbit, in the family Cucurbitaceae grown for its edible, immature fleshy fruit.